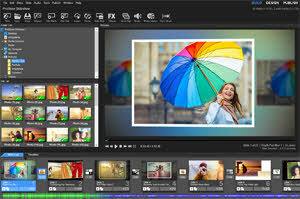 Photodex has announced version 9 of its award-winning ProShow Gold and ProShow Producer slideshow tools. ProShow is an easy-to-use software for Windows that allows photographers and enthusiasts to create high quality photo, video and audio slideshows. ProShow offers a wide-array of special effects, built-in creative tools and a royalty free music library for making extraordinary professional video slideshows to share online, on DVD and Blu-ray, or any device. Layer filters let users apply 45+ photo filters to their photos and videos with just a couple clicks. The curated set of filters can instantly bring new life to any photo or add vintage effects. New motion filters can create high energy photo and video animations with just a click – no video editing knowledge necessary. Over 150 new motion filters are included. The new follow filter lets creative users do even more, allowing for multiple photos and videos to move together onscreen. New 4K publishing allows users to output their slideshows in higher quality than ever before. The new Publishing Queue lets users prepare multiple different output formats, then let ProShow automatically create everything while they’re away from the computer. Plus, with the all new publishing history users can keep track of all the videos created for each slideshow. ProShow 9 is available in two versions, ProShow Gold, for enthusiasts, is available now for $69.95. ProShow Producer, for professionals, is available now for $249.95. Upgrade pricing is available for existing users. Available from www.photodex.com or by calling 1-800-37-PHOTO (1-800-377-4686).